The 20cm x 10cm Monojoy pouch is a great, cheap bit of kit for anyone who's worried about waking up to find their car stolen. Even if you don't have keyless start, those who can gain entry can steal anything you leave inside your car. And with this purchase, you get two pouches. It's pretty small, meaning our Audi key fob fits inside, but there are bigger pouches out there if you want to store multiple key fobs. The signal is completely blocked inside the pouch, so even if you put it in your pocket and the buttons get accidentally clicked, your car won't unlock. 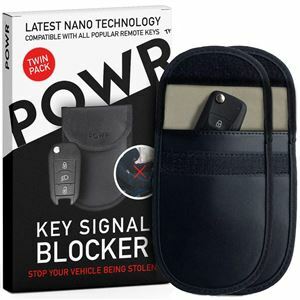 You can also easily carry the pouch around with you - which prevents thieves who wait for you to park and leave your car before blocking the signal, meaning they can get into your car using a signal extender even after you've walked a few hundred metres from the vehicle. Although, it's a bit too big to carry around in the average trouser pocket. After a while, most small signal blocking bags begin to look the same. So it's generally down to how well the bags are reviewed and priced. 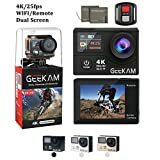 Despite looking like the Monojoy signal blocking pouch, and offering two pouches, the POWR bags are in this list because they're slightly cheaper and they're rated 4.8 out of 5 stars from over 670 Amazon reviews. POWR claims to have also extensively tested the durability of the pouch to make sure none of the seams will unravel, which is a complaint we've heard about the Monojoy pouches. The POWR Signal Blocking Pouches contain a single section, ensuring that every item within the closed pouch is completely protected too. 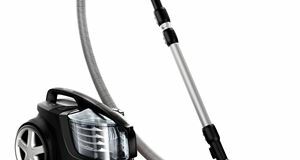 Power also offers a three-month money back guarantee for returned products. And it's a UK based company with UK Customer Services. Another option from Monojoy is this signal blocker pouch with signal blocking material stitched inside to prevent thieves amplifying your key fob signal and opening car. The bag also blocks calls, SMS, Wi-Fi and 4G (if you so desire to block those things). The interior silver layer blocks signals while the outer layer is a 680 denier waterproof oxford clot. There's also a small fabric loop on the bag in case you want to hang it up as you would do with a set of keys. 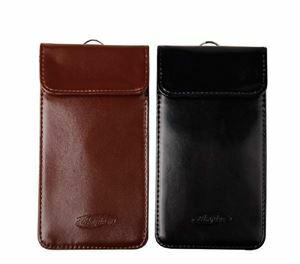 The pouch is 21cm x 12cm, which means it can fit multiple types of smartphones as well as multiple key fobs. Humble Bumble say the pouch is made of premium quality leather (white, black or brown) to ensure longevity - with a special dual weave nano signal blocking material inside the pouch and a hook on the top. Once your car keys are closed away in this pouch, thieves won't be able to amplify the signal to unlock and steal your car. It's also multi-purpose; protecting bank cards, key fobs and mobile phones (just make sure the key fob is placed in the correct pocket when using). You get a 30-day money back guarantee with your purchase and the company is UK-based with UK Customer Services too. 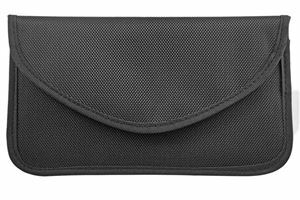 The pouch is 15cm x 10cm and has a 4.2 (out of 5 star) rating on Amazon from over 85 customers. The Vonetti Alpha Shield aluminium box takes a different design approach to most of the signal blocking pouches on the market. Outside dimensions are 8.6 x 2.7 x 4.8cm, with internal dimensions of 8.2 x 2 x 4.1cm - meaning the box is around the same size as the average key fob (like our Audi key fob). However, the key ring and manufacturer tag (plus any house keys you have on the key ring) won't fit. 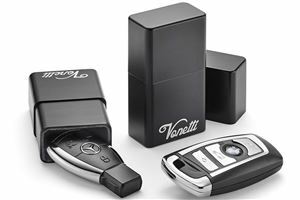 Larger keys, like new Volvo and Renault key fobs, won't fit either. 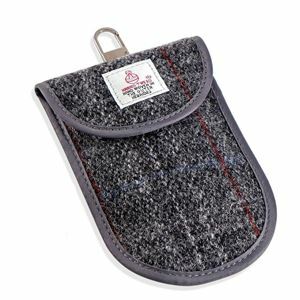 This MONOJOY pouch is identical to the MONOJOY pouch we reviewed here, this is just the grey Harris Tweed version for those who are willing to pay a tad more to be a bit fancier in your security endeavours. The car fob signal blocker pouch is stitched with a metallic, shielding material which stops thieves amplifying your key fob signal. 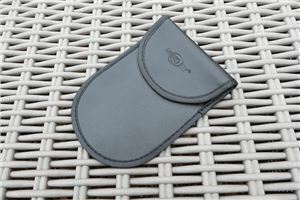 The 14 x 10cm pouch can be used to protect various items, like credit cards and mobile phones from signal hacking, though we haven't tested them for this purpose. The pouch is also fairly small, so only small phones will fit inside it. The Harris Tweed is 'handwoven in the Outer Hebrides of Scotland from 100% pure virgin wool', so probably worth the extra few quid over the plain black pleather pouch. 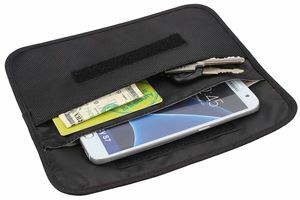 The Amplus Trading signal blocking pouch is a large, multifunctional faraday bag that blocks calls, text messages, Wifi, 4G, Bluetooth, RFID and NFC signal - making it ideal for drivers who want peace of mind regarding keyless car theft, as well as for those worried about having their contactless cards hacked. The two pouches you receive are two different colours to identify between different keys/pouch contents. The pouch is large (about 11cm x 21cm), which you can see in better context pictures if you click on the link below. It comes with a keyholder at the back, making it easier to attach to your bag or hang it on the keyholder. 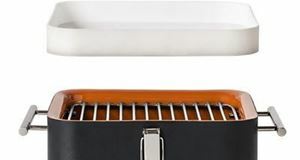 It can hold a large bunch of keys and consists of two inner pockets, which are both protected. The Wisdompro RFID signal blocking bag protects chip technology, like contactless credit/debit cards from hackers' RFID readers in the range of 10 MHz-3 GHz, as well as key fobs for keyless entry vehicles. The bag has an inner silver layer that blocks signals and an outer Oxford cloth layer. 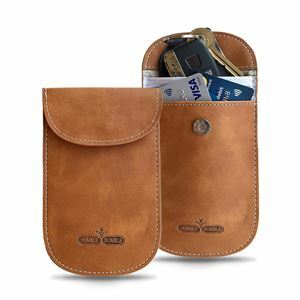 The pouch is a large 19cm x 8.9cm and can easily fit mobile phones and keys. It's about £7 and earns a respectable 4.6 out of 5 stars on Amazon from 260 reviews. 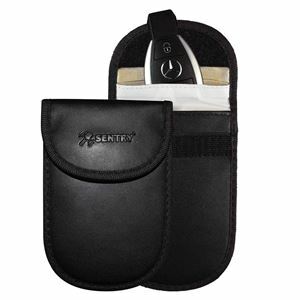 The Sentry signal blocking pouches have a 4.8 out of 5 star rating on Amazon from over 160 reviews. The 14.5cm x 9.5cm RFID blocking pouch is a sleek, slightly smaller pouch than others with enough space to keep most car key fobs safe from cloning. Bigger fobs, like those for a new Volvo or Renault, may not fit. 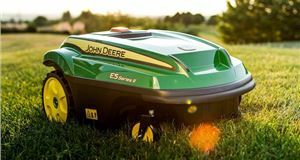 According to Sentry, if for whatever reason you are not completely satisfied with your purchase, they will buy it back from you with only one question asked... How can they make it better? The palm-sized case can be carried around in a bag or large pocket and, like most of these bags, has a leather-look outer material. 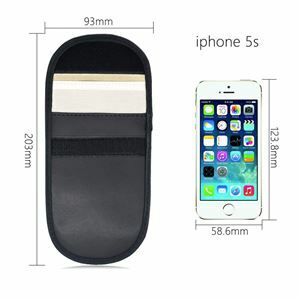 Images show the pouch is big enough to carry an iPhone 5S, but considering Apple recently launched the much larger iPhone X - we'd recommend buying it just as a key fob protector rather than to protect your mobile phone. Got a car with an electrical issue? A decent multimeter can make tracking down the fault far easier.